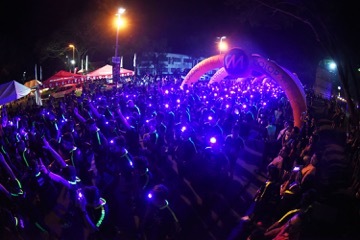 COLOR MANILA, leading organizer of ‘concept-fun runs’, had a very successful return to Clark, Pampanga last December 3, 2016 for its CM Blacklight Run. They had a record number of 6,000 participants joining the said event, which is said to be the biggest event COLOR MANILA has had outside of Manila, to date. The event was held at the Clark Parade Grounds and marked the third time that COLOR MANILA has held an event in Pampanga. Participants had various race finishes of 3K, 5K, and 10K to choose from. “We had two other events brought to Clark this year, the last event was CM Blacklight as well, and because of the partnership we have with the Clark Development Corporation (CDC), we have been able to grow our number of participants from 3,000 to 6,000 in just a span of three (3) months. The run has become a much-anticipated event for runners and first-time runners alike”, says Justine Cordero, Vice President of COLOR MANILA. Thousands of participants from Pampanga, Manila and some nearby provinces such as La Union, Baguio, Tarlac, Pangasinan and Bulacan joined the event. Some foreigners also flew all the way from Indonesia, US, and other countries, just to be able to experience the night run. Resident DJ Marxx Monterola with MC Dino also entertained the participants after the event. COLOR MANILA’s next Blacklight event will be held in Dagupan in partnership with CSI The City Mall on December 10, 2016, it will be their last event for 2016. For 2017, COLOR MANILA will start the year with its biggest annual event, COLOR MANILA RUN - YEAR 5, which will be held on January 8, 2016 at the Mall of Asia (MOA) Grounds. The organizers are anticipating 12,000 participants for this event. COLOR MANILA also recently announced in its recent press conference at Kerry Sports at Shangri-La at the Fort, its plans to bring their events to United Arab Emirates (UAE) and the United States. Registration is still open for COLOR MANILA Blacklight Run Dagupan at G/F CSI The City Mall-Dagupan. For COLOR MANILA RUN - YEAR 5 and other events, you may visit www.colormanilarun.com or FB/ColorManilaRun for more information.